Formulated by renowned fertility expert, Dr. Amos Grunebaum, patented FertilAid for Men has been scientifically demonstrated in a double blind, placebo controlled study to increase male fertility by increasing the total number of motile sperm a man produces. Fertile, healthy sperm are defined not just by the number of sperm (or count), but also by sperm concentration, by sperm motility and speed, and by healthy morphology (sperm shape and size). Sperm motility is is determined by the percentage of sperm that are moving and their capacity to “swim” in a forward direction. Healthy sperm motility allows sperm to sustain vitality and propel themselves through the uterus to the fallopian tube – and ultimately penetrate the surface of the ovum and fertilize the egg. 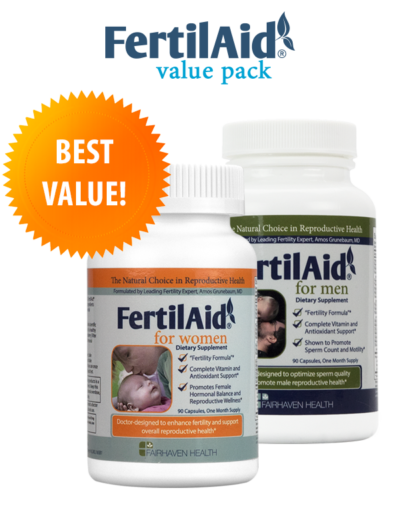 FertilAid for Men addresses these key issues in male fertility and reproductive health. With a proven natural formula that combines a potent blend of antioxidants, vitamins, and minerals with the amino acid, L-Carnitine, FertilAid for Men is designed to support the healthy formation of sperm and increase both sperm motility and sperm count. 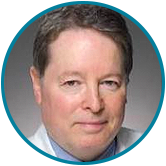 Clinical Study News: Results from an independent clinical study on FertilAid for Men published in the American Journal of Andrology indicate significant improvements in sperm health, with marked increases in the “total number of motile sperm.” Read more about the FertilAid clinical study. FertilAid for Men is an all-natural supplement designed to increase sperm count, improve sperm motility, and enhance overall quality. It features a blend of antioxidants, vitamins, and minerals that have demonstrated to enhance male fertility and improve overall reproductive health. L-Carnitine plays a vital role in the process of sperm development, in promoting proper maturation and morphology of sperm, and in ensuring the maintenance of sperm quality and vitality. FertilAid for Men contains an ideal dose of L-Carnitine – and in L-Carnitine’s most potent form, as L-Carnitine tartrate. Grapeseed Extract is a vital antioxidant that scours damaging free-radicals from your system. Free radicals cause oxidative damage to the body – a literal ‘rusting’ of tissues and cells. This damage can impact male reproductive function and disrupt fertility health. FertilAid for Mencombats free radicals with a dynamic array of antioxidants – including the scientifically-validated Grapeseed Extract. Studies indicate that supplements rich in antioxidants can dramatically improve male reproductive health. FertilAid for Men provides that dynamic antioxidant support. Complex Antioxidant Formula: Vitamins C, E, A, and Selenium are important vitamins and cleansing antioxidants that play a key role in repairing damage caused by the environment and aging – and in preventing cellular damage due to oxidizing free radicals. Vitamin E is an important antioxidant central to overall reproductive health and wellness. In a preliminary human trial, infertile couples just given vitamin E showed a significant increase in fertility. Like Grapeseed Extract, selenium is a potent antioxidant that can help minimize oxidative damage produced by free radicals. Maca Root and Asian Ginseng are herbal ingredients that have been scientifically demonstrated to improve sperm production and motility. 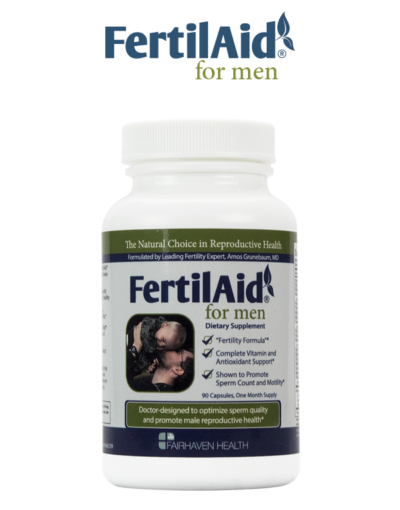 FertilAid for Men is the only fertility supplement that provides this important herbal-nutritional support. Zinc has been shown to to have a positive effect on sperm formation, sperm motility and testosterone metabolism. FertilAid for Men provides 30 mg of Zinc – a level commensurate with the dosages used in studies demonstrating its positive impact on male reproductive health. Betacarotene is a fat-soluble antioxidant that protects sperm from free radical attack. It’s also a precursor to Vitamin A, a key player in ensuring proper sperm maturation. Compare with other fertility supplement brands – which contains no vitamin A. FertilAid for Men 100% Daily Value of natural betacarotene for men of reproductive age. 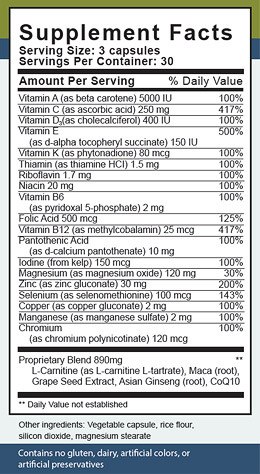 Provides 100% or more of the Daily Value of key vitamins and minerals. If you have been diagnosed with either low sperm count or motility, you might also consider one or both of the following products. CountBoost and MotilityBoost were doctor-designed to be taken along with FertilAid for Men to help address these conditions which can negatively impact your fertility. … over 10 Million couples are trying to conceive a baby in just the U.S. alone. Of those 10 million couples, 1 in 6 will experience difficulty in becoming pregnant. As part of a healthy lifestyle, FertilAid is designed to optimize your chances of conceiving – by bringing together select herbal ingredients and key vitamins in an all natural, non-prescription formula. 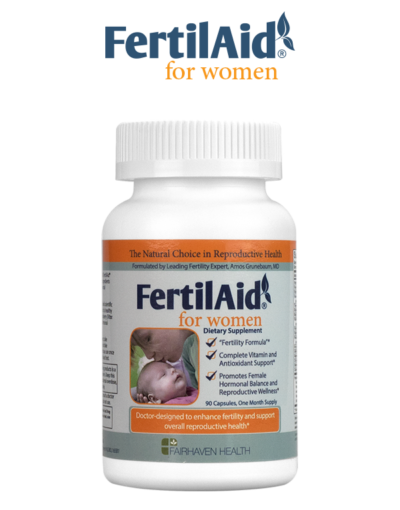 FertilAid for Women promotes the restoration and balance of hormones that play a central role in menstrual health and regular ovulation, supporting a woman’s reproductive organs and the development of reproductive tissues.